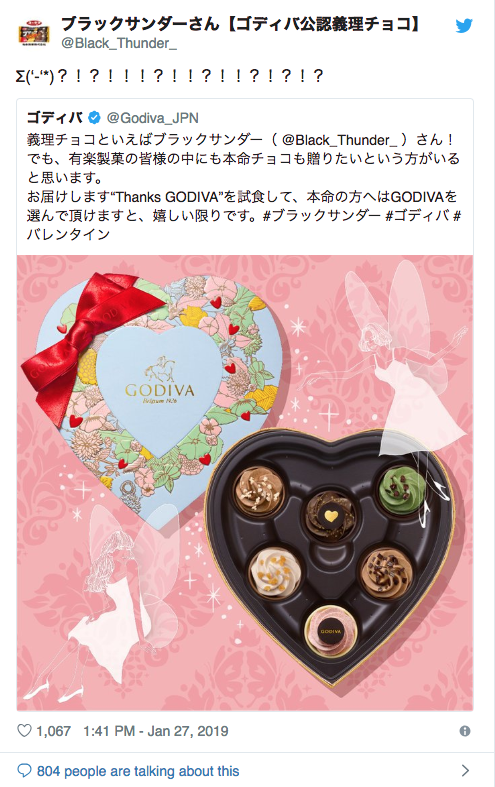 Almost exactly one year ago the Japanese branch of Belgian chocolatier Godiva made a point of letting Japan know how it feels about the country’s practice of giri choco. Also known as “obligation chocolate,” giri choco are the sweets that women in Japan give to platonic male acquaintances, primarily coworkers, on Valentine’s Day, as a general-purpose thank-you for any help they’ve provided over the past year. On Feb 1, 2018, Godiva took out a one-page newspaper ad trying to convince Japan to drop the giri chocolate practice. In response, Japanese company Yuraku Confectionery, makers of Black Thunder, Japan’s most unabashedly popular obligation chocolate, issued a statement saying “You do you, and we’ll do us,” and that Yuraku is happy to support those who want to continue the decades-long tradition of giving giri choco (which isn’t as universally disliked by women as some people might assume). Godiva went quiet after that, but all of a sudden, this week the company brought up the obligation chocolate issue again, going so far as to call out Black Thunder by name in an unexpected tweet last Sunday, in which it also talked about honmei chocolate, chocolate that a woman gives to a guy she actually has romantic feelings for. About an hour and a half later, the official Black Thunder Twitter account gave its reply, or as close to a reply as it could manage: a confused kaomoji emoticon face followed by a bunch of confused question marks and startled exclamation points. 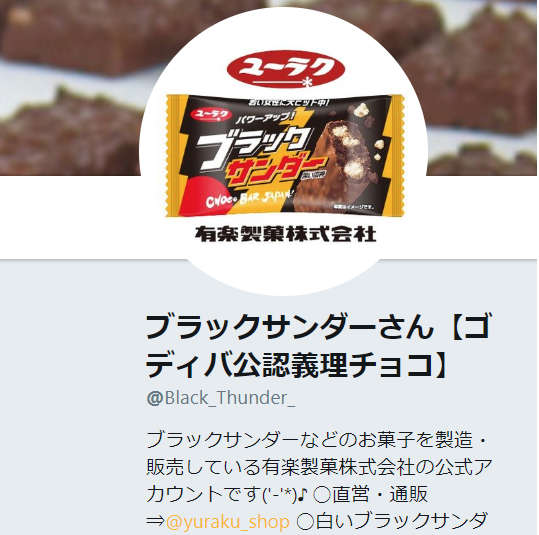 At the same time, the Black Thunder Twitter account changed its name to “Black Thunder (officially recognized by Godiva as obligation chocolate to ブラックサンダーさんゴディバ公認義理チョコ) in Japanese text. 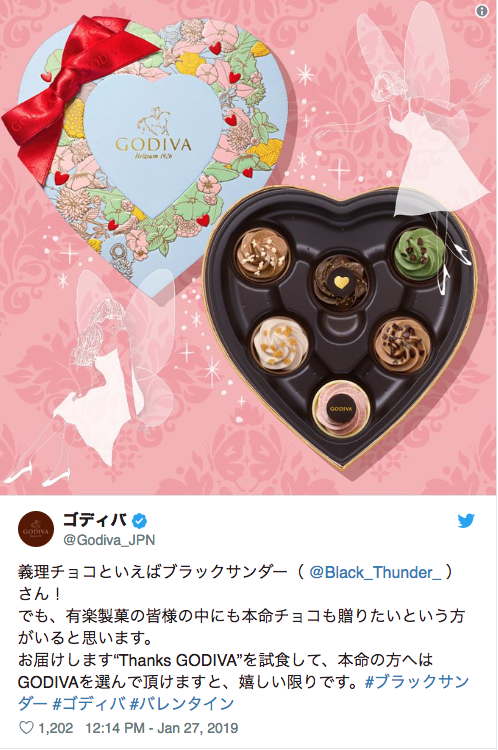 Godiva is yet to make any sort of follow-up to its suggestion that Yuraku Confectionery’s female employees shun their own company’s products and buy Godiva instead for the special men in their lives, and maybe that’s for the best, considering that Black Thunder seems to always be ready to take their lemons and turn them into tasty lemonade. Who knows, maybe the admirably thick-skinned, open-minded Yuraku Confectionery will extend a chocolate-covered olive branch and release a special Godiva Black Thunder crossover next year. Free advertising for Black Thunder. I love BT, especially the ice cream. I'll buy them any day over Godiva. I somehow would pass on Black Thunders on my previous stays in Japan. (Previously I was hooked on Look or Dars.) Maybe it was because they were so cheap? It was only in the most recent stay that I tasted one for the first time. They were quite tasty indeed!